For many observers, Turkey remains an enigma. Increasingly the country is seen through the prism of one complex man – the commanding presence of President Recep Tayyip Erdogan. Considered from the historical perspective, the situation today is unusual. For decades, Turkey was regarded as a secular Muslim state that saw itself being closer to Europe than to the Middle East along its southern borders. 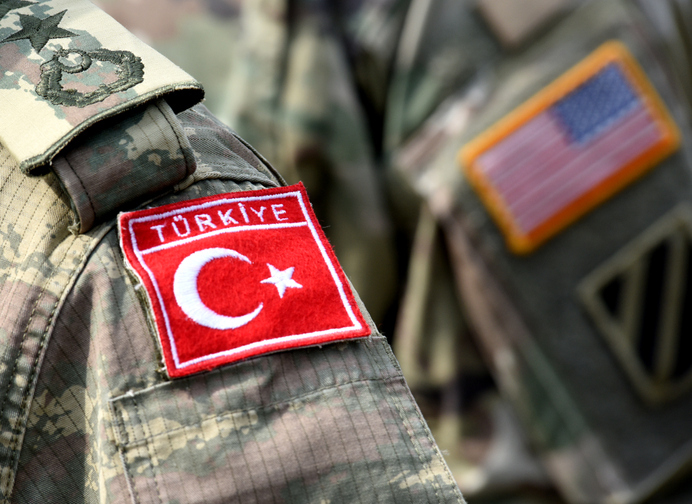 Throughout the Cold War, Turkey was also viewed as a key member of NATO, guarding the southern flank of the alliance and frustrating efforts by the former Soviet Union to stir up instability in various Middle East countries, notably Egypt and Syria. With the collapse of the pre-eminent Soviet threat to NATO in the early 1990s, Turkey’s role lost importance. Then in 2002 questions were asked about the reliability of Turkey as a Western ally when its government declined US and UK requests to stage a northern flanking move into Iraq through its territory. The realization that Turkey could not be taken for granted in this endeavor was perhaps the first time that Western allies woke up to the notion that Turkey’s strategic stance might be shifting. Turkey has also long aspired to be a member of the European Union (EU). But EU-Turkey relations have fluctuated over the years as other EU member states have equivocated over Turkey’s record on human rights and the alignment of the structure of the Turkish economy with EU requirements. When Recep Tayyip Erdogan was elected Prime Minister in 2003, Turkish politics was still dominated by the powerful Turkish military. The Turkish Army had staged coups d’état against successive civilian governments in 1960, 1971 and 1981. In April 2007, it issued a “Statement of Interests” emphasizing its guardianship of Turkey’s political secularity and the memory of modern Turkey’s founding leader, Mustafa Kemal Ataturk. It is worth emphasizing this point to understand the manner in which Mr. Erdogan has overseen a complete and fundamental change in the nature of Turkish politics, shifting a military-dominated and firmly secular state up to 2007 into a notably different system today. Particularly following the failed 2016 coup, the military has been effectively marginalized and President Erdogan’s brand of ‘Moderate Islamism’ has become dominant, with the full support of the power and reach of his pro-Islamist Justice and Development Party, the AKP. Arguably, Turkey’s political paradox in the past has been that while the Turkish military buttressed the country’s pro-Western diplomatic and political leanings, the manifestly undemocratic record of military intervention in the country’s politics became one of the major stumbling blocks facing Turkish aspirations to join the EU. Today, by contrast, even though the military has been marginalized, Turkey seems even further away from its EU ambitions, with some political scientists now insisting that Turkey can no longer be considered a properly democratic state. Since the 15 July 2016 coup attempt, President Erdogan has moved to close most independent media outlets and imprisoned many journalists. As of November 2018, according to the Stockholm Center for Freedom (SCF)[ii], Turkey has convicted 71 journalists, arrested a further 168 and maintains a list of 148 that it still wishes to detain. The Turkish President also used the coup to justify moves against many of his political opponents, not just amongst opposition parties but also amongst the judiciary and the senior ranks of civil society. In addition, Mr Erdogan used the opportunity afforded by the failed coup to clear the way for wholesale changes to Turkey’s constitution, shifting Turkey’s presidency from a primarily ceremonial role to one with wide-ranging executive power. These developments led a group of policy academics under the banner of The Project on Middle East Political Science to publish a collection of essays[iv] that broadly concluded that Turkey could no longer be regarded as a proper democracy. This important conclusion as a preamble opens the way to considering whether Turkey has mostly abandoned its pro-Western leanings and ambitions for EU membership. Moreover, there are questions about a pro-Islamist state that has become more tolerant and even supportive of Islamist extremism, some would suggest even terrorism, all in pursuit of neo-Ottoman ambitions, above all in the Arab World. It is widely understood that there is no internationally accepted definition of terrorism[v], or for that matter of Islamism. That said, in its broadest sense, terrorism is a term used to describe the use of violence with the deliberate intention of intimidating a population in order to bring about political change. From this perspective, Turkey has long and often been a victim of terrorism. First and foremost, Turkey has faced persistent terrorist challenges from the Kurdish separatist group PKK for more than 30 years. Although this study is now a decade old, it is suggested that its general conclusion still holds and the Turkish government’s enduring struggle to suppress demands for Kurdish secession is continuing. In addition to the PKK, over the past decade Turkey has also struggled with new challenges posed by Islamist extremist groups. The picture was captured in a CNN report on a terrorist attack in an Istanbul nightclub in the first hours of 2017. Considering why Turkey appeared to be such a prominent target for terrorists, Eliza Mackintosh[vii] pointed out the shifting foreign policies of President Erdogan’s post-coup Turkey. With a 500-mile long border with Syria, Turkey has clearly been unable to avoid the bitter civil war in Syria, which has increased political instability and reduced security across the country. At the start of the Syrian war, then Prime Minister Erdogan was prominent in his backing for Syria’s Sunni rebel forces against the Alawite regime of Bashar al-Assad. There can be no doubt that Erdogan saw the Syrian conflagration as an opportunity, not only to unseat an old regional rival but also to benefit from the anticipated success of the Sunni Islamist rebels. The rebel forces failed to gain enough traction to unseat Assad and then faced Russian intervention in Syria while Islamic State (IS) arose. Erdogan was forced to change tack, apparently recognizing late in the day that IS presented a direct challenge to the stability of the Turkish state and was no part of an opportunity to inflict defeat on Assad’s regime. This strategic shift has forced Turkey to confront two very significant terrorist challenges simultaneously. It seems that the state has lacked the capacity and capability to do so effectively. Moreover, with his ambition to marginalize Turkey’s military, President Erdogan now lacks the sheer combat power he arguably needs to fight asymmetric wars on two fronts. Accordingly, Erdogan has attempted to counter the threat from one extremist movement one step at a time. To do so, he has been forced to make accommodations with terrorists that might not otherwise have been necessary. The Turkish President has been there before. In 2013, Erdogan’s government sought rapprochement with the PKK, bringing to a temporary halt more than three decades of Kurdish extremism and violence. However, the newfound peace also encouraged the emergence of the pro-Kurdish HDP; a party that made gains in Turkey’s subsequent elections and, for a time at least, secured sufficient seats in the Turkish parliament to frustrate Erdogan’s overarching ambition to change the constitution to allow an executive presidency. This was a clear political challenge to his plan to take that very role. In 2015, the Kurdish conflict and Islamic State were intertwined in fighting. In July, the US confirmed a previously rumored agreement with Turkey to use Incirlik, close to the Syrian border, as the primary base for the US air campaign against IS. At the same time, Turkey agreed that it would support the counter-IS campaign. However, rather than focusing on IS targets, Turkey used the opportunity to attack Syrian Kurdish targets, undermining the influence of Turkish Kurds and their HDP representatives in the Ankara parliament. The pact with the Kurds inside Turkey collapsed in 2016, leading to a renewed spate of Kurdish terrorist attacks against mostly military and police targets. Some observers have argued that Turkey’s leadership actively facilitated the rise of IS amidst the chaos of the Syrian conflict, seemingly content to allow many thousands of would-be IS recruits to transit through Turkey on their way to Syria. Border control with Syria was fairly lax, at least in the early stages of the conflict, and this allowed some freedom for both IS fighters and weapon supplies to move into Syria from Turkey. In 2013 alone, it is estimated that more than 30,000 would-be fighters crossed through Turkey to join IS. In turn, it has been suggested that Turkey has seen the development of a network of IS logistic hubs, escape routes and safe houses, all increasing IS’s presence inside Turkey and making the country a major node for international Islamist terrorism. By the end of 2016, Erdogan clearly recognized that his previous apparent insouciance about Islamic State had landed Turkey in a strategic predicament. Moreover, amidst accusations from Ankara that Washington was protecting Fethullah Gulen, the man that Erdogan accused of mounting the summer’s failed coup, while the US was apparently no longer willing to fulfil its previous “red line” threats, the Turkish leadership seemed to have no other choice than to accept Russia’s leadership in Syria and shift its strategic posture firmly against IS. The result of this Turkish volte face against its Sunni co-religionists was an immediate rise in IS violence, now directed at Turkey. The Reina nightclub attack in Istanbul in the early hours of 1st January 2017 killed 39 people and seriously injured another 70. It was the most prominent of a series of IS strikes and plots that continues to this day. As recently as last month, Turkish security forces claimed to have disrupted an IS plot, centered on Adana, to carry out attacks on Turkish targets on 29 October, Turkey’s Republic Day. Turkey also says it is confronting a full-blown campaign by the PKK once again. In October 2018 alone, Turkey claimed to have “neutralized” 210 PKK terrorists. In April 2018, Turkey’s Foreign Minister, Mevlut Cavusoglu, was content to claim much of the credit for the eventual “defeat” of IS[xiii]. Unsurprisingly, he was not forthcoming on Turkey’s lack of strong action against IS when it began its ascent. So it seems that one can argue that Turkey miscalculated badly in its response to the challenges posed by IS. The foreign fighters who passed through Turkey, including IS recruits, failed to realize President Erdogan’s strategic ambition of unseating the Assad regime. IS in turn increased Turkey’s own internal terrorism challenges. In 2017, Michael Rubin, a former senior figure at the US Pentagon and now with the neo-conservative American Enterprise Institute, went so far as to argue that Turkey and Pakistan should be added to the list of countries the US condemns as state sponsors of terrorism. There is no suggestion here that Turkey should be regarded alongside Iran as a “state sponsor of terrorism”. Instead, there seems to be greater concern that Erdogan continues to pursue a self-serving agenda that at times has embraced what might be described as a “pragmatic approach” to assuaging terrorist threats from both the PKK and IS. In so doing, Turkey’s leaders may be seen as complicit in helping both groups to further their aims at different times through appeasement and a failure to take a longer-term strategic view of the possible consequences of not bearing down robustly on the terrorist challenges facing Turkey. It should be borne in mind that Turkey is not alone in this failing. Its record may be criticized for apparent strategic incompetence and poor statecraft, but, once again, this does not amount to state sponsorship of terrorism. Turkey has long been the target of Kurdish terrorism and it continues to this day. For decades now, successive Turkish governments, both military and civilian, have confronted the efforts of PKK separatists within Turkey’s Kurdish community to use terrorist violence to force Turkey into allowing the Kurds to secede and become an independent nation state. In fact, the drive for Kurdish independence remains a powerful motivational force amongst the Kurdish peoples in Syria, Iran and Iraq, as well as in the south-east corner of Turkey. While the rights of Kurds to self-determination are acknowledged internationally, they are still not so strong as to enable an independent Kurdistan to be carved out of the territory of four UN-recognized states. While Iraq has long granted semi-autonomy to the Kurds in the north of the country, with a capital in Irbil, the Turks have remained more hard-headed and are strongly opposed to following this example. With a future peace settlement for Syria now being widely discussed, it seems possible that Syria’s Kurds may at last win some measure of independence from Damascus, even if the Assad regime remains in power. Should this come to pass, it seems probable that this will increase the pressure on Turkey and with that pressure may come a further surge of Kurdish activism, including an increase in violence by the PKK. Turkey also proved itself vulnerable to the emergence of IS. In many ways, it seems that President Erdogan misread the threat, particularly as in the early days of Syria’s civil war he clearly saw opportunities to provide tacit support to Islamist extremist groups that looked likely to topple the Assad regime. There seems little doubt that Turkey’s government, in its failure to block the transit of extremists and IS oil through its territory, contributed to the rise of IS as a threat to the region and to international stability. As a member of NATO and an aspiring member of the EU, Turkey’s actions may now be condemned as irresponsible. But this also calls into question the very nature of President Erdogan’s national and personal ambitions. He is routinely accused of seeking to rebuild an Ottoman sphere of influence across the wider Middle East. His embrace of the Muslim Brotherhood and support for political Islam more generally have set him at odds with other countries in the region. It is suggested that President Erdogan’s political stance remains at odds with the realities of Turkey’s place in the world. In many ways, his autocratic, anti-democratic style has cost his country dearly in terms of international support, not only amongst former Western allies but also across the Arab world. It is therefore argued that it is this very weakness, rather than Turkish strength, that leaves the country vulnerable to terrorism. Far from being a state sponsor of terrorism, in the manner of Iran, Turkey in its weakened political and economic state seems most likely to continue as a victim of terrorist violence with all the economic and politically destabilizing consequences such challenges create. [i] BBC News – Statement by Turkish Army, 28 April 2007. http://news.bbc.co.uk/1/hi/world/europe/6602775.stm accessed 9 November 2018. [ii] Jailed and wanted Journalists in Turkey. Stockholm Center for Freedom. 17 November 2018, https://stockholmcf.org/updated-list/accessed 22 November 2018. [iii] Tisdall, S. Recep Tayyip Erdoğan: a dictator in all but name seeks complete control. The Guardian, 19 April, 2018 – https://www.theguardian.com/world/2018/apr/19/recep-tayyip-erdogan-turkey-president-election-dictator-seeks-total-control – accessed 22 November 2018. [iv] Baker, L. POMEPS STUDIES 22 Contemporary Turkish Politics – 07 December 2016. https://pomeps.org/2016/12/07/contemporary-turkish-politics-2/ accessed 7 November 2018. [v] Jenkins, J P. Definition of Terrorism, Encyclopaedia Britannica: “Terrorism is the systematic use of violence to create a general climate of fear in a population and thereby to bring about a particular political objective. Terrorism has been practiced by political organizations with both rightist and leftist objectives, by nationalistic and religious groups, by revolutionaries, and even by state institutions such as armies, intelligence services, and police.” https://www.britannica.com/topic/terrorism accessed 6 November 2018. [vi] Zehni, T. “Turkey and PKK Terrorism”. Monterey June 2008. https://web.archive.org/web/20110531224347/http://edoc.bibliothek.uni-halle.de/servlets/MCRFileNodeServlet/HALCoRe_derivate_00003560/Turkey%20and%20PKK%20terrorism.pdf accessed 7 November 2018. [vii] Mackintosh, E. CNN Report “Why Turkey is Such a Target for Terror” dated 12 January 2017. https://edition.cnn.com/2017/01/04/europe/why-turkey-is-terror-target/index.html accessed 8 November 2018. [ix] Yayla, A and Clarke, C. Turkey’s Double ISIS Standard. Foreign Policy 12 April 2018. https://foreignpolicy.com/2018/04/12/turkeys-double-isis-standard/ accessed 6 November 2018. [x] Yayla, A. The Reina Nightclub Attack and the Islamic State Threat in Turkey. CTC Sentinel March 2017 https://ctc.usma.edu/the-reina-nightclub-attack-and-the-islamic-state-threat-to-turkey/accessed 22 November 2018. [xi] Cockburn, P. Turkey accused of recruiting ex-Isis fighters in their thousands to attack Kurds in Syria. The Independent – 7 February 2018. ttps://www.independent.co.uk/news/world/middle-east/turkey-isis-afrin-syria-kurds-free-syrian-army-jihadi-video-fighters-recruits-a8199166.html accessed 22 November 2018. [xiii] Cavusoglu, M. The Meaning of Operation Olive Branch. Foreign Policy magazine 5 April 2018. https://www.aa.com.tr/en/todays-headlines/turkey-6-feto-linked-terror-suspects-arrested/1304116 https://foreignpolicy.com/2018/04/05/the-meaning-of-operation-olive-branch/ accessed 1 Nov 18. [xiv] Country Reports on Terrorism 2014 – pp 148. US Dept of State Publication. Released June 2015. https://www.state.gov/documents/organization/239631.pdf accessed 2 Nov 2018. [xv] Humud, C, Pirog, R, and Rosen, L. Islamic State Financial and US Policy Approaches. Congressional Research Service dated 10 April 2015. https://fas.org/sgp/crs/terror/R43980.pdf accessed 2 Nov 2018. [xvi] Coats, D. Worldwide Threat Assessment of the US Intelligence Community dated 13 February 2018. https://www.dni.gov/files/documents/Newsroom/Testimonies/2018-ATA—Unclassified-SSCI.pdf accessed 5 Nov 2018.